In October, Governor Cuomo and NYS DOT Commissioner McDonald provided a boost for bicycle and pedestrian infrastructure by announcing $70 million in federal Transportation Alternatives Program (TAP) funding for 68 projects in communities across the state. Several of these awards will fund additions and enhancements to the Erie Canalway Trail. In western New York, Erie County received $980,160 and the City of Buffalo $1,580,000 for improvements to the Shoreline Trail/Erie Canalway Trail which extends from Buffalo to Tonawanda along the Niagara River.It is clear that Governor Cuomo and Commissioner McDonald recognize the importance of completing and enhancing the Erie Canalway Trail. The NYS Canal Corporation was awarded $985,600 to construct 1.5 miles of trail between Fort Herkimer Church and Lock 18, helping to close the seven-mile gap between Ilion and Little Falls in the Mohawk Valley. 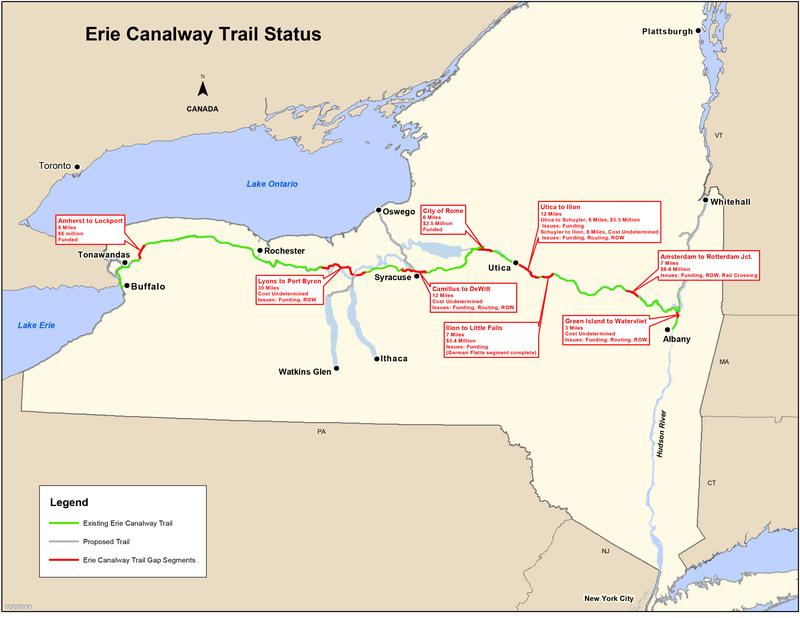 Erie County also received $760,000 for a former PTNY Healthy Trails, Healthy People program project, the Tonawanda Rails to Trails Extension, which will link North Buffalo to the City of Tonawanda where trail users can access the Erie Canalway and Shoreline Trails and the Niagara River Greenway. 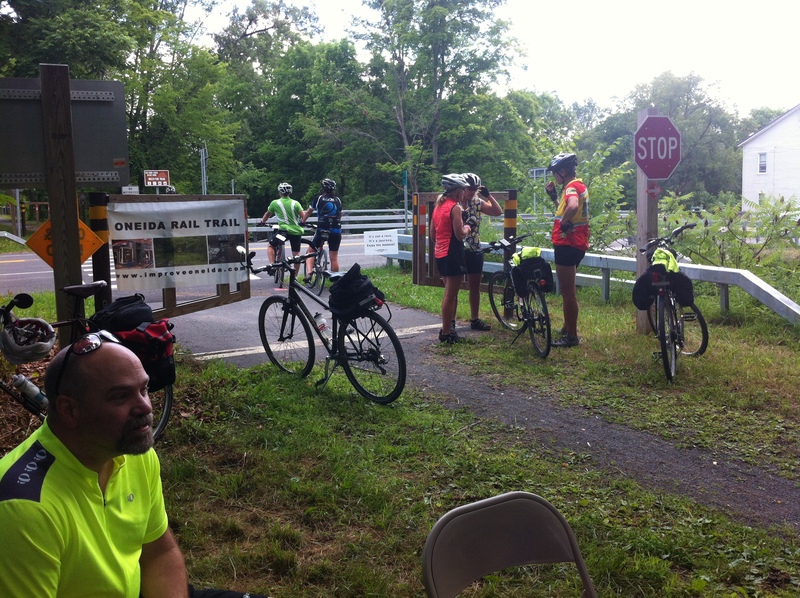 Earlier this month, PTNY and the Canal Corporation hosted Bicyclists Bring Business Roundtable and Bike-a-Round events in the Tonawandas and found improved access and trail connectivity to be major selling points both for trail users and for the local economy. In Central New York, the Canalway Trail community of Oneida was awarded $716,000 for continuing work on the Oneida Rail Trail and City Center project. When complete, the Rail Trail will be an 11.3-mile trail network running through the heart of downtown Oneida, with connections along three abandoned railroad lines to the Village of Wampsville, the City of Sherrill, and the Erie Canalway Trail. Also in central New York, the Canalway Trail Village of Canastota received $250,513 for Phase II of enhancements to South Peterboro Street, the village’s main thoroughfare which intersects the Erie Canalway Trail. Congratulations to all the communities and trail groups that received funding. Great work! Read the full list of funded projects.